It’s my first day at work, I hadn’t been told what time I was expected at the office so I pitched up at 9.00 am , as it turned out the official start time was 8.00 am but I still received a warm welcome from Channy who is the Executive Director and one of the founder members of CRDT. We had a chat and Channy briefed me on the organisation and the new structure that was being put in place. The new structure was going to have an impact on some of the management reporting with the business being separated out into 3 distinct areas. Part of my job was to make sure the management reporting mirrored the new shape of the business. I was then introduced to the rest of the team including Sarith who is the Finance Manager and given a tour of the office. The day flew by and before I knew it I was back at my apartment trying to cool down and wondering where to get some dinner. Most of the places to eat in Kratie are tiny open air café/bar type places with a few tables and chairs just off the street. They are all very similar, selling Asian food and cold beer at very reasonable prices. In the first few days here I’ve stuck to food that I recognised or knew and I have not been tempted to try some of the local delicacies such as duck foetus ( complete with feathers ) or deep fried tarantula. Maybe next week! 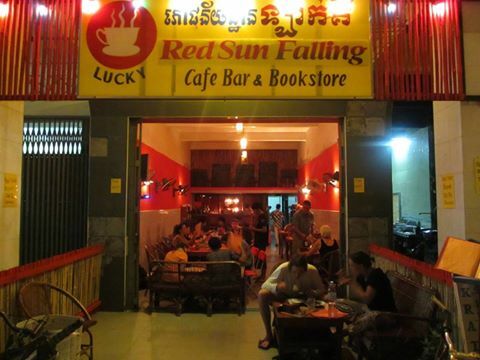 I went to “Red Sun Falling” a lively place overlooking the Mekong river. It’s the perfect spot to watch the sun go down over the river. A bottle of beer here is $1 USD and a main course is about $4USD. The official currency of Cambodia is Riel and you get around 6,200 Riel to the £. Most businesses however take USD which is the unofficial currency, even the ATMs dispense dollars. It’s normal to pay in USD and get your change in Riel. I went back to the flat and had another a restless night. I decided I couldn’t stay another day there, it was just too hot and horrible! I had a meeting the next day with Channy and we agreed on new accommodation, this time with air-conditioning. I was put up in a traditional Cambodian guest house called Le Tonle. Le Tonle is a not-for-profit venture that is supported by CRDT. There is a small restaurant too and the whole operation is run by young people who are learning about the hospitality industry. My first impressions are very favourable and I’m looking forward to many comfortable nights sleep in my new accommodation.